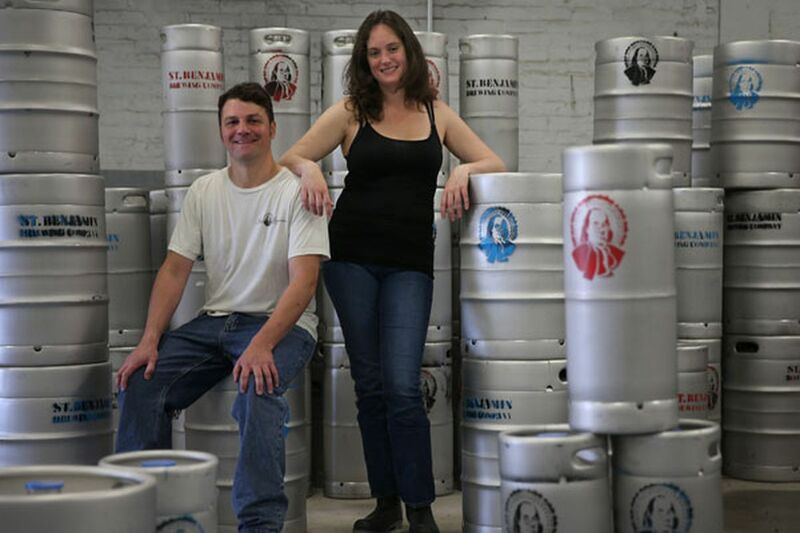 Tim Patton (left), founder of Saint Benjamin Brewing Co, and brewer Christina Burris with some of their kegs in Philadelphia on May 27, 2014. The Kensington brewery and taproom is closing May 4, after nearly five years in business. Kensington’s Saint Benjamin Brewing Co. will close next month after five years in business, the company announced in an Instagram post early Monday morning. The post attributed the shutdown to the sale of the brewery’s building at 710 N. 5th St.
City records do not yet list the building’s new owner. Owner Tim Patton could not immediately be reached for comment. A request for comment made to the company’s press email account and taproom was not returned. According to the posting, there are no plans to open a new location. “The owner is choosing to pursue other endeavors,” a comment from Saint Benjamin’s official account read. Though it was incorporated in 2010, Saint Benjamin Brewing Co. took a couple years to find a home at the former Theo. Finkenauer Lager Beer Co. near the intersection of North Fifth Street and Cecil B. Moore Avenue. And it took even longer to pour its first pints, which it did at Philly Beer Week festivities in May 2014. Two years later, in 2016, the brewery opened its 12-tap, 50-seat taproom, thanks in part to a $25,000 Empowerment Zone Grant from the city. The brewpub also served Pennsylvania wines and spirits. In 2017, Saint Benjamin grabbed the attention of Inquirer food critic Craig LaBan’ annual Brewvitational craft beer competition; it took home first-place awards for best new beer (Franklin Abbey Dubbel) and best lager style (Pilsner Prosim). In 2018, the brewery’s Ultraviolet Grisette took home a second-place Brewvitational award for best canned beer.